You looking for a pen to carry with you for the rest of your life? When it comes to pens, you’ve got a lot of different avenues you can go. You can go cheap and plentiful (think the ones stocked at the office) that are just replaced whenever it breaks, runs out, or is lost. You can get very compact (and sometimes weapon-ish) ones if you’re going the tactical EDC route. There are also very high-end luxury pens, made of exotic materials and the like. So, in many ways, they’re a lot like watches. 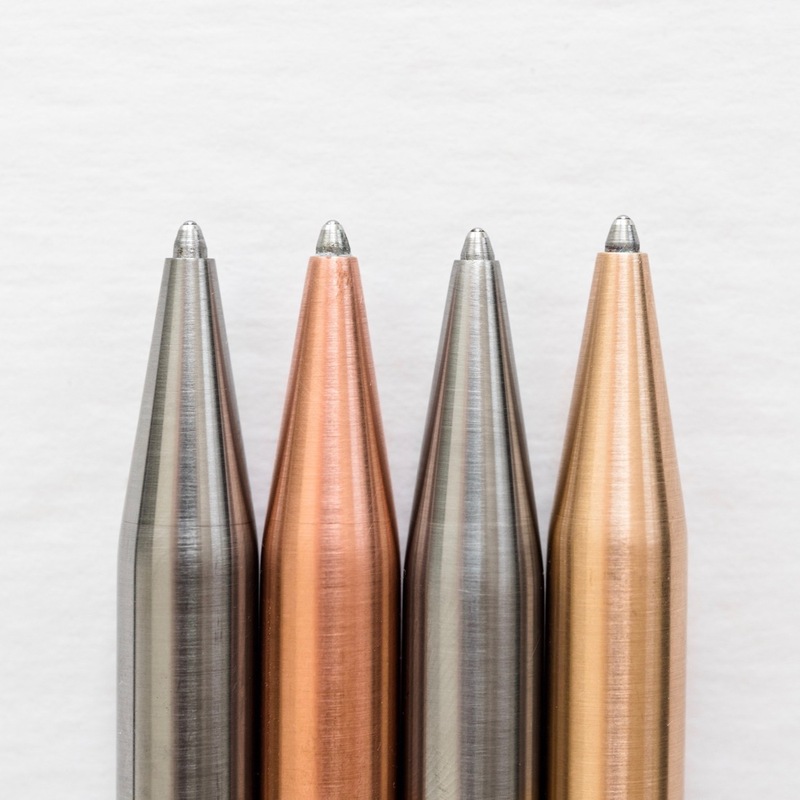 Well, the pen I ran across on Kickstarter kind of takes the best of many categories – made of metal (so it lasts forever), takes standard refills, is sleek and minimal, and is built right here in the good ol’ US of A. Given the decided lack of a name on the KS page, I’m just going to call this The Pen from Modern Fuel. Now, with The Pen, it’s actually following after a very successful mechanical pencil that Andrew Sanderson launched on Kickstarter back in 2017. It looks to me, from reading through the campaign page, that Sanderson took what he learned from that pencil and definitely applied it here for The Pen. Here, you’ve got the choice of titanium (paging Victor! ), stainless steel, copper, or bronze. Each metal of course brings it’s own unique properties to the table, and gives you some color choice that won’t wear off like a coating would. I also like how Sanderson has committed himself to the longevity of The Pen. He’s making it know that the components he designs work with his prior designs. So, should something break or wear out, you can get replacement parts – from the latest generation – that would fit into your pen. Of course, there’s a lifetime warrantee as well, which means if something goes wrong, you send the pen back, and he’ll either fix it, or make you a new one. What makes The Pen different from others you’ve seen – aside from the sleek lines and absolutely invisible separation between the components – is how he’s made the clicky mechanism. Sure, there’s a spring and cap, and all that. But in there you’ve got a machined brass component that has a ball bearing cycling around. This was, again, done for reliability and longevity. It does require the pen to be upright to use the clicky (gravity and all that), but it’s a clever design, and one that I hope is robust enough to stand up to regular use. Next articleOdor-free workout socks? That’s what the MP Magic Socks are offering!